National Grid has published its latest Future Energy Scenarios (FES) report. This year, electric vehicles (EVs) top the list of key challenges covered by the influential research, pushing battery storage off the top spot for the most disruptive new technology for power networks. FES 2017 has downgraded National Grid’s expectations for battery storage deployment in the UK throughout the 2020s across all four of its speculative scenarios – notwithstanding a subsequent announcement from government that it will invest £246 million in new battery development. Meanwhile, the growing pressures being placed on power networks by increasing numbers of EVs appeared more of a pressing concern to Grid. The rise of the EV has been rapid, and its growth shows no signs of slowing. 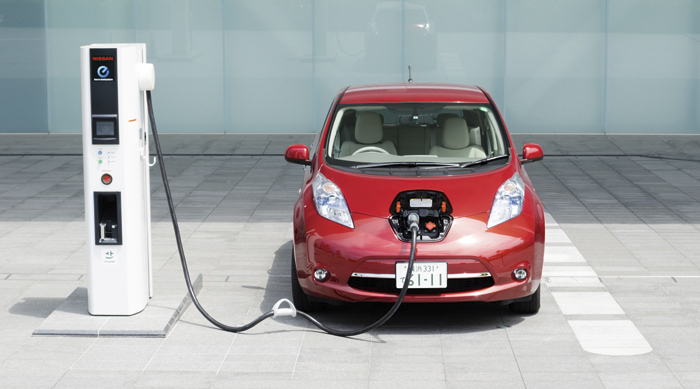 There is a government goal in place for EVs to make up 9 per cent of the UK’s fleet by 2020. The target is felt to be critical to achieve the required shift to a low-carbon economy. Forecasts from National Grid suggest that as many as 9 million EVs could be on the UK’s roads by 2030. By 2050, electric vehicle sales could account for more than 90 per cent of all cars. In the most extreme scenario laid out by Grid – “consumer power” – EVs add a further 18GW to the current peak demand of 60GW by 2050. Even the most modest estimations of EV growth set out by Grid – in its “steady state” scenario – will demand infrastructure investment and innovation to support charging peaks. At a distribution level, networks are alert and sensitive to this challenge. Western Power Distribution (WPD) says that an electric vehicle can more than double the demand on the local electricity network from a home when charging at peak times. “If many homes in a local area adopt EVs, and they all charge at peak times, then the local electricity network will need greater capacity and intelligence,” said the distribution operator in a recent research update. Investing to provide this capacity and smartness will require more than small change. The costs to reinforce local networks – for example, by replacing cables, overhead lines or substation equipment – to accommodate EVs is estimated to be at least £2.2 billion by 2050. Some networks will have to dig deeper sooner than others. Research carried out by Baringa Partners found that 18 per cent of UK adults would consider buying an EV for their next car. However, in London, the figure was 36 per cent. The consultancy’s Oliver Rix also tells Utility Week that as networks move to mitigate the risks EVs pose to network resilience and reliability, they must take care not to seem obstructive, or to alienate customers with an appetite for EVs. His caution is timely. UKPN – whose licence area covers London – recently came under fire when a story in the Times claimed the company was “calling for the right to remotely control vehicle charging as a last resort to prevent power cuts”. One such “smart and flexible” solution on the table is the rollout of systems which incentivise EV charging at certain times of day. Grid describes smart charging as “some kind of tariff-based system”, which can shift EV owners away from charging at peak times – whether through conscious action and behaviour change, or via automated services which manage charging on their behalf. WPD is optimistic that smart charging could reduce the amount of cash it needs to sink into network reinforcements for EVS. The network hosts an ongoing NIA-funded project – Electric Nation – which aims to develop tools – which will be available to all DNOs – to ensure their networks can cope with the “massive new challenge” of EV-charging, without having to replace cables and substations. The project has begun installing free smart chargers for eligible consumers and gathering data on their impact on demand management. Smart charging is a “significant enabler” to maximising the use of EVs, and accommodating the decarbonisation of the UK’s transport system, a spokesperson for the Energy Networks Association tells Utility Week. The group says it is “essential” that electricity networks have visibility of the location, availability and dynamic usage of charging infrastructure if EVs are to be supported without compromise to the reliability of energy supplies. It also calls for new commercial standards to be developed to allow for safe, secure, and interoperable smart charging to be realised. “ENA’s Open Networks Project, which will lay the foundations for a smart grid in the UK, is one way that energy networks are contributing to meeting these challenges,” says the trade body. The challenges posed by EVs to the stability of security of the national power grid are becoming increasingly urgent as uptake swells. Networks are not blind to these challenges and are working hard to develop technologies and market mechanism which mitigate risks. However, the goal posts are constantly moving. It’s possible that the solutions developed via today’s EV demonstrator projects will become redundant as a new wave of EV batteries with faster charging times and bigger capacities come to market. Then, too, advances in automated EVs could overturn learnings about EV charging behaviours. For networks grappling with these uncertainties, Grid’s EV projections and analysis make essential reading. The growth in EVs is fuelled primarily by advances in technology, such as battery capabilities and cost reductions, making them a viable alternative to ICEs (internal combustion engine cars). In National Grid’s ‘consumer power’ scenario, consumers’ desire for the latest technology is what helps drive the growth in EVs. The lowest growth is seen in ‘steady state’, where both pure EVs and plug-in hybrid EVs each achieve only 15 per cent of sales of all cars by 2050, that is 30 per cent in total. In all the other scenarios, pure EV sales overtake plug-in hybrid sales before 2040. The scenario with the most EVs is ‘two degrees’, where, to meet the 2050 carbon reduction target, 100 per cent of all cars sold are pure EVs by 2045. Current peak demand is around 60GW, so the additional contribution of 18GW from EVs in ‘consumer power’ is significant. Peak demand rises steeply from the mid-2020s, and shows no sign of slowing throughout the next two decades. In this scenario, Grid believes that about a quarter of consumers are engaged with time-of-use tariffs. Therefore, three-quarters of those who charge their vehicles do not move away from peak time charging. ‘Two degrees’, on the other hand, experiences a much more modest rise in its peak demand. Even though all cars are pure EVs by 2050, they make the least contribution to peak demand of all the scenarios (only 6GW).